I know Christmas is around the corner when my mothers house smells like fresh pine trees, I see the decorations and taste all the delicious cookies. Without those few simple things stimulating my senses; Christmas just wouldn’t be the same. This year, take advantage of the wonderful things this season brings and explore them scientifically. Let me walk you step by step through the process of having your very own Christmas senses activity. Gather 3-5 distinct or tricky (depending on your kids) objects that relate to the Christmas season. You will have the kids exploring with all of their senses so make sure that the objects you choose are safe to touch or taste. Print off this worksheet (FREEBIE) to record your kids findings. This activity is only a challenge if the objects are unknown so make sure to keep your supplies covered or hidden until its time to explore. I choose to use small glass jars to help isolate the smells better but you can use whatever you like. You could even just have a pile on your table if that’s your style. This one is easy, just get out bandanas or a scarf. Whatever prevents your kids from using their eyes. A toque would even do the trick, and yes, I am Canadian. YouTube has become a great tool that we use with our lessons, almost daily. It gives me a moment to do any last minute preparations or quickly throw in a load of laundry. Quick videos are seriously a lifesaver and my kids love it. You can search for your own videos for this lesson or watch my favorite clips about senses. 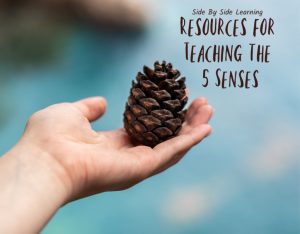 To start off your lesson introduce the concept of the five senses. If your kids are already aware of the concept now is the perfect time to review. Turn on a quick video or discuss the senses. Before you bring out your objects cover your children’s eyes. Then one by one explore your objects by smelling, tasting and touching them. We watched the nose video (see above for links) then smelled our objects and then recorded our observations. The worksheet has enough space for your kids to write themselves or you can dictate for them. How does this smell? Is it sweet? Is the scent strong? Familiar? You can write down their answers or have them predict what the object is. Repeat this strategy with each object. Once you only have sight left have your kids guess what the items are to see if they are close. To end an amazing sensory activity you might as well enjoy the scents of Christmas. Eat some warm apple pie with cold ice cream and drink some hot cocoa while snuggling up reading a favorite Christmas Story. Moments like these are what memories are made of. Merry Christmas to you!! What scents reminds you of Christmas? Lindsey is the Mum of four adorable, energetic, monkey like kiddos. Her home as always been focused around Christ, learning and dance parties. Life is meant to be enjoyed so she strives to find happiness and laughter everywhere she turns. She is a planner addict, mediocre wake boarder, lover of naps and always has a Dr. Pepper nearby. She blogs at Side By Side Learning. You can find her on facebook but her ultimate favorite place to hang out is instagram. PrevPrevious Post3-in-1 Learning Magnets: Educational fun for children!